3. Send messages with your brand new personal icon! PERSONALISE YOUR EMOTICONS TODAY WITH REAL SMILE! as everyone else when you can make your own!? Just like Whatsapp, but with your own smiles! Whichever option you choose, making your own emoticons – and showing your friends and family how you’re REALLY feeling – is quick and simple! Just use you real smiles (and whatever other faces you want to pull) on the real smile app. 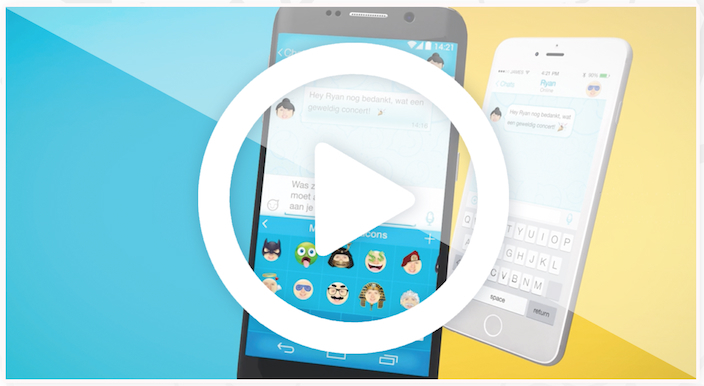 Send instant messages to friends and liven up your conversations. Take a picture and turn your face into hundreds of customizable emoticons to add a personal touch to your messages. No need to worry about finding the right emoticon anymore - just make your own! Check out our video to see how it works. Check out our video to see how it works for yourself. Create the Real Smile emotion to suit your mood. The combinations are limitless! No more looking for a less-than-perfect, plain old boring emoticon. Say what you really want to say, with hundreds of items and styles to choose from – and limitless combinations! We’ve got dozens of different themes to pick, and lots of incredible bundle packs to give you endless hours of fun creating some hilarious smiles! Download the app, and get creating! With loads of different packages to choose from and thousands of ways to combine items, send a Real Smile for just about ANY occasion you can think of ! Use all our packages and all your custom emoticons on either iMessages or in our amazing Real Smile messaging app! Get the best, funniest instant messaging app – and ADD your own unique emoticons. Check it out. Download The Real Smile app now! Use with iMessage or get our exciting instant messaging app! Check it out! Create your own Real Smile emotion in just three steps! Click the photo icon to get started and share with your friends. Every month, you have the chance to vote for your favorite Real Smile emoticon. The winning emoticon will feature in the starting package for every future download of the Real Smile App! Got any questions, queries or suggestions for Real Smile? If you need any help with Real Smile or want to make any suggestions for future updates, send us an email here, and we’ll get right on it! Copyright © 2016 | Real Smile - All rights reserved.